Anthony’s compositions range from solo and chamber works to larger orchestral pieces.He has recently written works for the National Youth Wind Ensemble, British Clarinet Ensemble, Philharmonia Orchestra and the BBC singers. 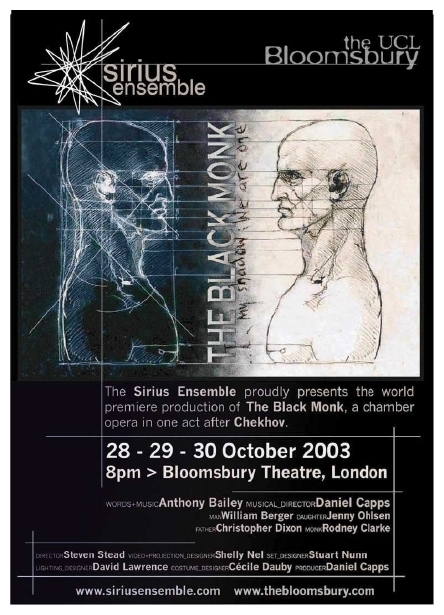 His first opera The Black Monk, based on the Chekhov short story, was premiered in 2003 at the Bloomsbury Theatre, London, with a fully professional cast and production. The following year his Chamber Symphony was selected by SPNM to join the organisation’s composer shortlist. Anthony has since written several more choral works including And there was beauty... for the BBC Singers.He has also written Wind Orchestra works for the RCMJD Symphonic Wind Orchestra and the National Youth Wind Ensemble. The Philharmonia commissioned Anthony to write an encore for them to perform at Highgrove Palace for HRH The Prince of Wales, which he conducted himself. Anthony now writes for all sorts of professional groups, orchestras and choirs. contact Anthony on antbailey@hotmail.com to find out more.